In a large saute pan, melt butter over medium-high heat. Add the onions, celery and garlic and cook until tender, about 5-7 minutes. Add mushrooms, sage, rosemary and thyme and cook until mushrooms are tender, about 5 minutes. In a medium bowl, whisk together eggs, chicken broth, salt and pepper. 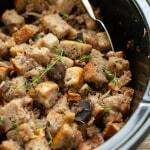 In a greased slow cooker, add bread and fold in walnuts. Pour broth mixture over bread and gently toss to evenly coat the bread.